We grabbed a sample of every cable from the piles in the SEG and HQ Mart markets, then verified the actual model against datasheets. 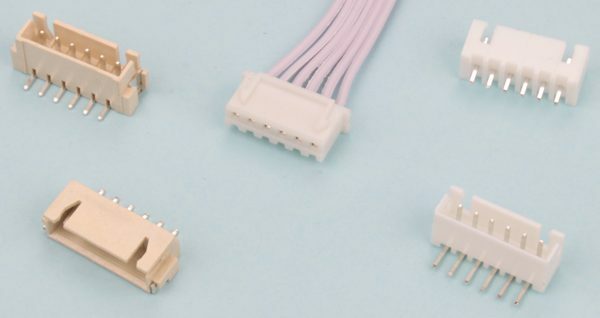 In this post we look at the common connector families available from multiple manufacturers. 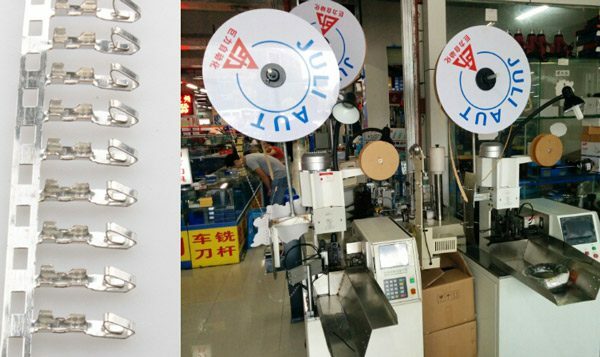 Sometimes market traders call the connectors by an unofficial part number, we've included these to help you communicate with Chinese vendors. Reels of crimp contacts and wire load into a crimping machine. The machine strips the wire, attaches the crimp contact, and cuts the wire to length. Specific tooling is needed to attach and cut each type of crimp. Manufacturers can't attach a crimp without the right tooling for their crimp machines. Most cables in the market connect to a circuit board (cable to board), some connect two cables (cable to cable). A few will do both. First let's look at the common cable to board connectors. Let's call this the simplest cable in the market. It mates directly with standard 2.54mm (0.1”) pitch pin header. It's the only connector we found that isn't polarized, it can attach in any direction. Frequently called a DuPont connector, even in Chinese, but the current common version seems to be compatible with TC Connectivity's AMPMODU IV series. We're going to call it CRimp HOusing (CRHO) because it's the most bog standard thing in the market. CRHO is borrowed from the amazing and unloved OOMP project. This one is hard to tie down, and it seems to be a widely confused part. 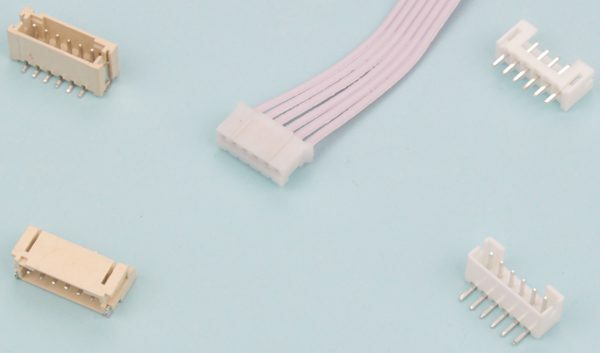 Chinese market traders and most of Taobao call this "SH 1.25", as in a 1.25mm version of the JST SH 1.0mm connector above. We've also seen it called A121-xxY/A1251-Hxx, which may be a duff manufacturer part number. This is actually a Molex 1.25mm "PicoBlade" 51021 compatible part. It's no wonder Molex parts get nick names. Molex has a knack for making really crappy part numbers, and has even "upgraded" to new numbers that are worse than the old numbers. 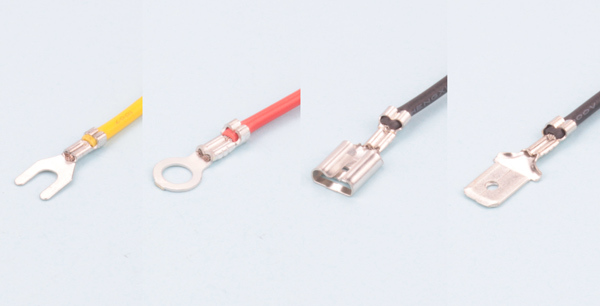 A 1.5mm pitch cable compatible with the JST ZH series. A vendor said this isn't a commonly requested cable type, but there isn't a shortage of suppliers in the market or online. 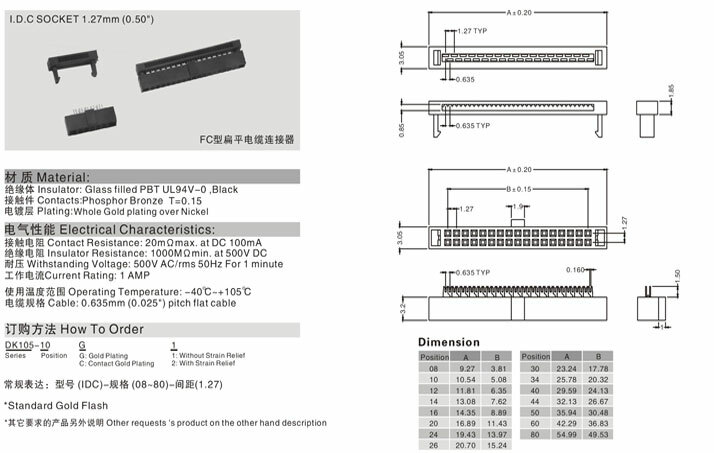 An SMD top entry PCB mount connector is not an official part in the JST datasheet, but it's widely available in the Chinese market. We named this connector BxB-XH-SM4-TB following the JST part numbering system, but note that it is not an official part number. There are two oddities in this family. An XHP-20 crimp housing and connector exists with 20 pins in a 10x2P configuration. 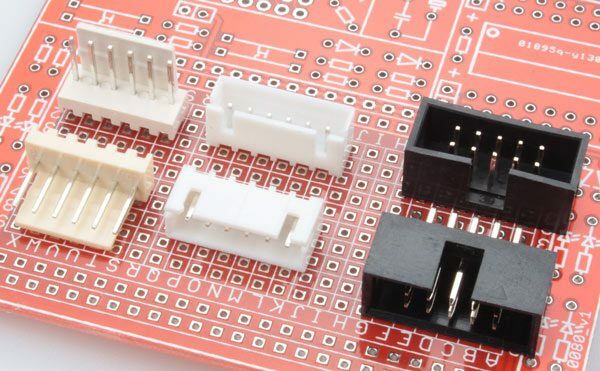 The through-hole side entry PCB mount connector also comes in a short shroud (7.2mm) version (SxB-XH-A-1). These specialty options don't seem to be available in the Chinese markets. 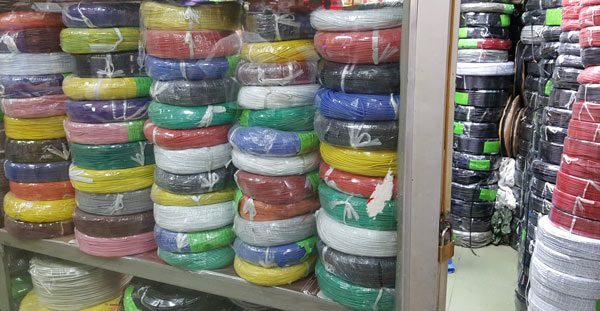 A 3.96mm pitch nylon connector that the market vendors call "CH". Heavy duty crimps and heavy duty connectors make this a good choice for power connections. It has a retention "bump" that helps secure the connection. The retention bump also helps polarize the connection, but nylon is flexible and the connector could be installed backwards with enough force. This part is not from JST, despite a similar part number. 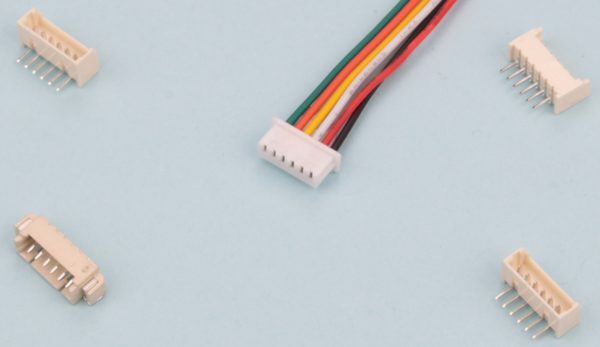 Some duff manufacturers list this as 2139-xxY, similar to a Molex part number, but that isn't an exact match for the board mount connectors. We use the market vendor name "CH", short for CHina connector. Insulation displacement connectors (IDCs) are a cable to board connection system that doesn't use crimp contacts. Teeth in the connector cut through the insulation of a ribbon cable and make contact with the wires inside. These connectors have been around forever, but there doesn't seem to be a solid part numbering system. Generally the displacement connector part number is FC. The PCB mount connector is DC3 (DC2 and DC4 are variants with locks and wings and such). We created our own part numbering system based on this convention that takes into account newer, smaller 2.0mm and 1.27mm pitch IDC versions. Bog standard 2.54mm IDC and mating shrouded header. It has a polarizing key that only fits one way, but there's no retention mechanism aside from the friction fit. Fits 1.27mm ribbon cable. Smaller. An even metric measure. What's not to love? 2.0mm IDCs save a bit of board space, but are still easy to hand solder for most people. 1.27mm pitch IDCs are the smallest available in the market. Fewer manufacturers and suppliers than 2.0mm and 2.54mm IDCs means they're more expensive and harder to source. The right-angle through-hole connector was only available as a special order of MOQ (200 pieces). 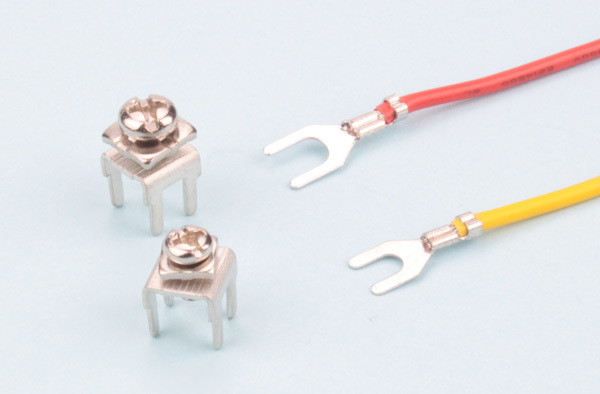 2.5mm (not 2.54mm) JST RCY series compatible connector. Commonly used as a battery connector and only available in a 2 pin version. Market vendors simply call this "JST 2P". 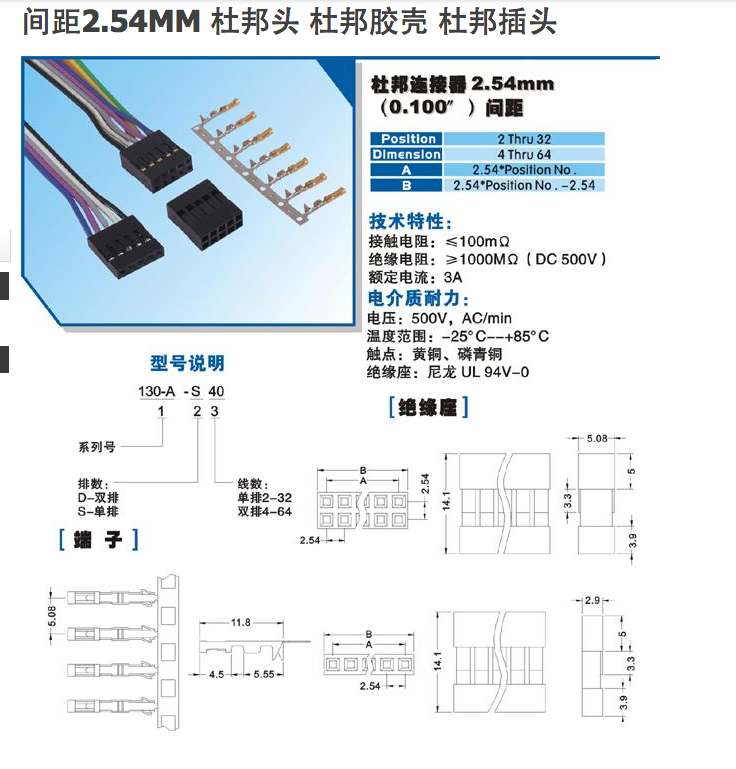 Molex 5557 4.2mm "Mini-Fit" compatible connectors are familiar from ATX power supplies and computer motherboards. The crimp receptacle is 5557-xxR. It mates with cable to cable plug 5559-xxP, and through-hole PCB mount connectors 5566-xxA and 5569-xxA. 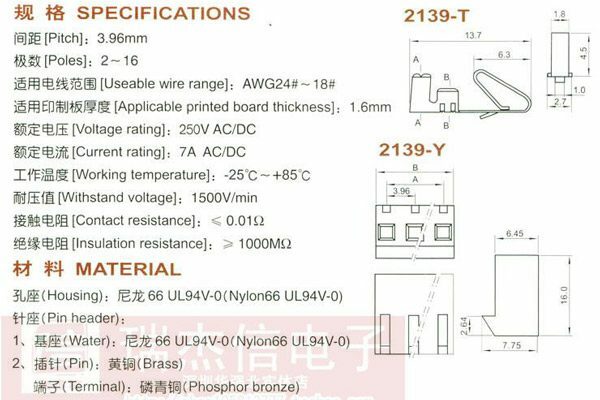 The datasheet lists black crimp housings (5557-xxR-BL,5559-xxP-400), but they're not common in China. 3.0mm Molex "Micro-Fit" 43025 series compatible connector. This is a smaller 3mm version of the 5557 series above. In fact, Market and Taobao suppliers call this "5557 3.0". The crimp receptacle is 43025-xx00. It mates with cable to cable plug 43020-xx00, and through-hole PCB mount connectors 43045-xx12 and 43045-xx00. 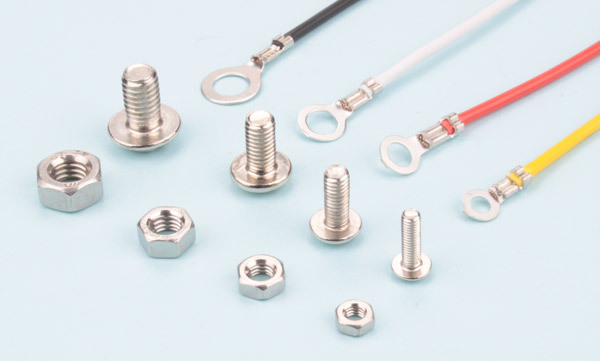 Through-hole PCB mount connectors are widely available in the Chinese market. Molex sells a surface mount version too, but we can't find cheap domestic production so we're not including it here. A male pin crimp contact that fits into the standard CRHO housing, we're calling it CRimp HOusing Male (CRHO-M) for short. Useful for breadboards and temporary connections to female headers. 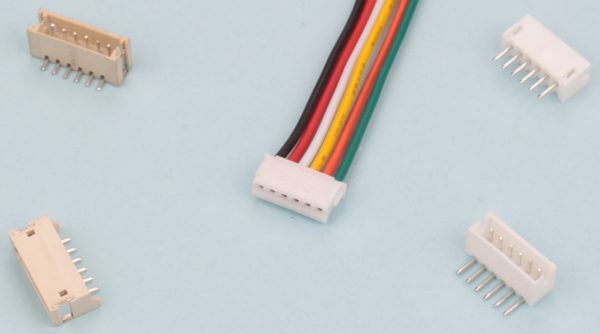 Most of the connectors we found are compatible with popular designs from Molex and JST, but we assume they're made by secondary manufacturers (duff manufacturers). In this post we list specs from the original manufacturer's datasheet where available. Tolerances and rating may not be the same for the duff parts from the market. Be sure to leave wide safety margins for current and voltage when working with no-name Chinese cables, and inspect the final cable to ensure it's properly suited for the intended load. Get cheap custom cables for your project, direct from Huaqiangbei. Use the Dirty Cable creator to drag and drop wires and connectors into a cable and price custom cables from quantity 100. Crimp terminals lock to the end of a wire and attach to an electrical connection such as a screw or terminal block. 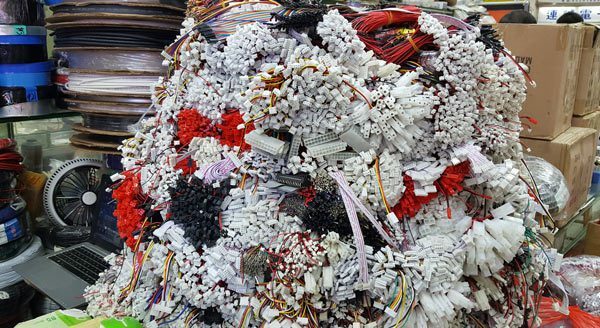 There are tons of different styles out there, but we found a handful that every Chinese cable manufacturer stocks. This is important because while reels of crimps are cheap, each crimp uses different tooling and manufacturers only buy tooling for the most common crimps. 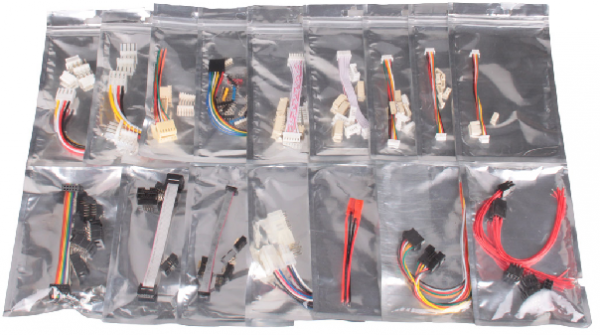 In the previous post we covered commonly used JST and Molex compatible parts from the Shenzhen markets. These connectors come in two parts: a metal crimp that attaches to the wire, and a plastic crimp housing that holds all the crimps in place. This post looks at common crimp terminals that don’t use a plastic housing. Get the sample kit here, or build your own custom cables here. These super common crimps attach to a bolt or screw terminal block. Four sizes are super common in the market and all fit a corresponding metric bolt size: 3.2mm (M3 bolt), 4.2mm (M4), 5.2mm (M5), 6.2mm (M6). Smaller and bigger sizes are available, but the crimps are rarely stocked so you’ll generally be on the hook for MOQ if you stray from this safe range. Our manufacturer recommends 18AWG wire for all crimp terminals. Spade or fork terminals attach easily to a bolt or screw terminal without fulling removing the screw from the terminal. We only found these in 3.2mm (M3) and 4.2mm (M4) in the market. These work with common screw terminals and grounding bolts, but we found these really nifty PCB mount connectors (through-hole) with a single screw terminal. 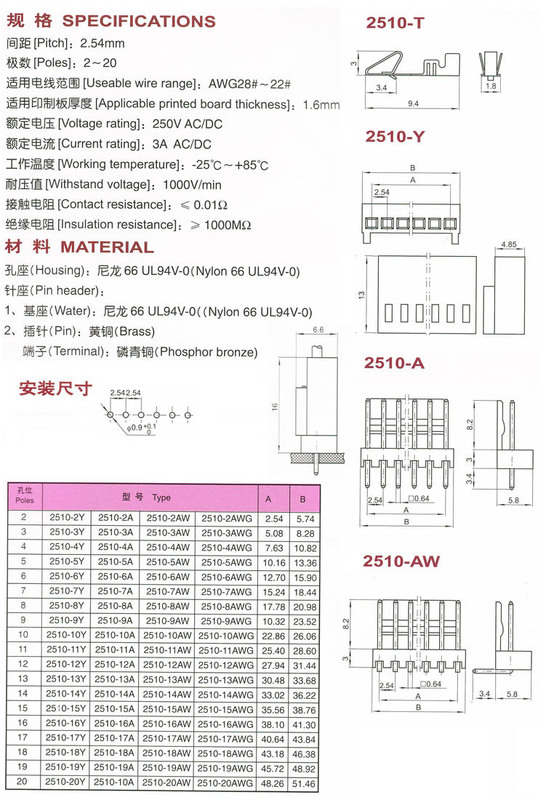 The manufacturer has a range with parts numbers from PCB-1 to PCB-14 that vary primarily in the height of the leads. PCB-2 is the most compact and lowest profile version, so we’ve been working with it. 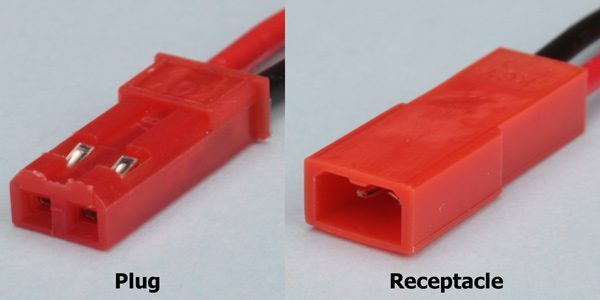 Male and female blade terminals connect cables to board mount connectors AND cables to other cables. Available in multiple sizes, but 2.8, 4.8 and 6.3 are the most common. 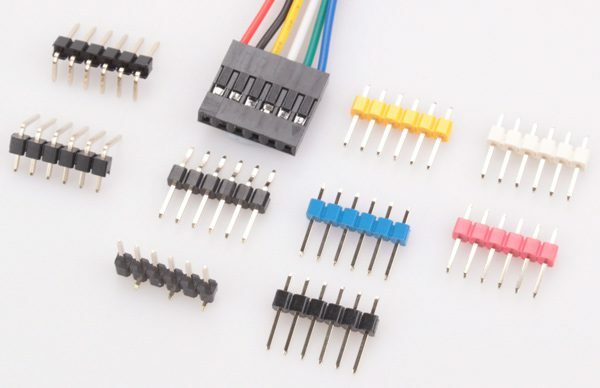 There are multiple type of terminal blocks for connecting female blade connectors to PCBs or wiring harnesses. 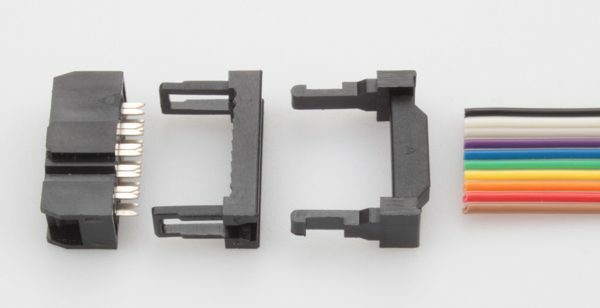 We found single PCB mount connectors (through-hole) for use with female blade crimps. The smallest versions (2.8) use 0.5mm thick metal, while the 4.8 and 6.3 version use thicker 0.8mm metal. The two bigger connectors have offset tabs to provide additional stability. 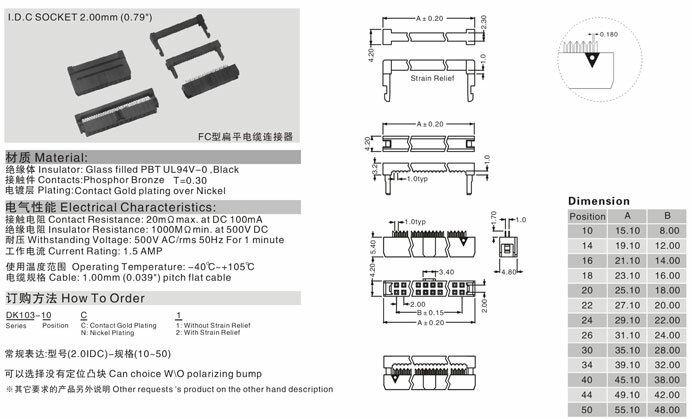 A lot of available crimp terminals are missing from this list: male and female bullet connectors, right angle blade connectors, etc. A reel of these crimps is not expensive, but most cable manufacturers don’t have the proper tooling work with them in their crimping machines. Crimp tools can range from $100 to $1000s, depending on the machine and if the manufacturer has to customize the tools. If you’re looking to do low volume cheaply, it’s always best to use what multiple manufacturers and distributors have available in the market. All three types of crimp terminals have compatible insulators in multiple colors. We’re not yet equipped to offer these in the dirty cables creator. Please note that we’re unable to provide maximum ratings at this time. 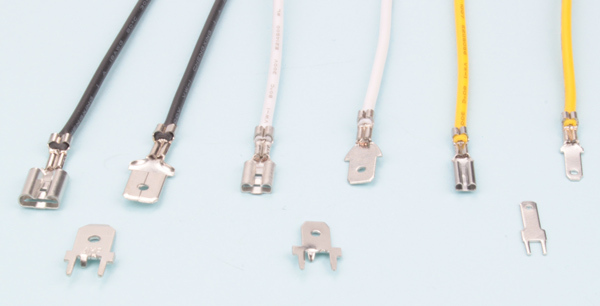 Our cable suppliers don’t have datasheets for the common “duff” stuff they’re using, so you’ll need to do the same due diligence on the final cables that you would if buying directly in China yourself. We’ll need to find our own crimp terminal manufacturer and supply parts to the cable maker ourselves to get properly rated parts. Buy the kit. Can’t wrap your head around it without getting your hands on these parts? Don’t worry, we’ve got you covered. All these crimp terminals and mating connectors are available in the Dirty Terminal sample pack. Grab it in the store for $4.95.